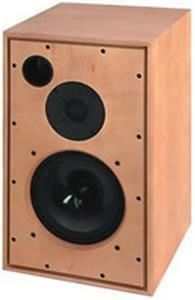 The Monitor 30.1, featuring the patented Harbeth RADIAL cone, takes resolution a step further. The larger cabinet allows for greater power handling, and the RADIAL cone provides the most natural mid band of any monitor. Used and trusted by sound engineers who are editing on very long shifts, the Monitor 30.1 is completely free from the coloration and makes musicians and artists appear in front of you. The 30.1's replaced a pair of Spendor SP100a's I've owned for close to 20 years. I kept the Spendors, I wanted something a little smaller. The reviewers love the 30.1's and I do, too. The 30.1's have the best mid-range I've heard, and a good sound stage almost without regard to placement (I was curious so I moved them around a dozen times in the last week). That said, if these disappeared overnight and my Spendor SP100a's were there instead, I would still be happy. Both are great speakers, just a little different in emphasis. Harbeths are more accurate, and slightly more musical. Spendors are smoother, maybe more forgiving of errors in the source material. Never heard an acoustic guitar sound better than on the 30.1's. The build quality / wood work is awesome. Worth the $$$ and 1/3 the cost of the current SP100's.